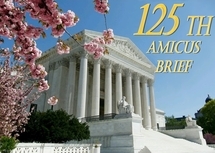 Today, our firm was honored to have filed its 100th amicus brief in the U.S. Supreme Court. This brief supported a petition for certiorari filed by the state of Arizona. Arizona is seeking to have the Supreme Court review and reject a Ninth Circuit opinion which struck down Arizona’s decision not to issue driver’s licenses to illegal aliens who are part of President Obama’s unconstitutional DACA program. Our brief explains that the Ninth Circuit below had wrongly assumed that there is only one type of citizenship in this country — U.S. citizenship. On the contrary, the Constitution provides that American citizens are citizens both of the United States and of the state where they choose to reside. However, the Constitution says nothing about aliens. The Ninth Circuit wrongly assumed that federal citizenship governs state citizenship, and that states have no authority over those who are not U.S. citizens. Our brief also noted that Arizona’s decision cannot possibly be prohibited by the Constitution’s Supremacy Clause, which applies to only “laws of the United States.” DACA is nothing more than a political decision by one president not to enforce the law. It is not a “law” enacted by Congress and signed by the President; and since it is revocable at will, nor is it a “rule” which has fixed and precise standard governing conduct. Thus, DACA cannot possibly “preempt” Arizona’s state policies. Next, our brief noted the political bias contaminating the Ninth Circuit’s decision. Although claiming its decision had nothing to do with equal protection, the Ninth Circuit’s opinion focused on Arizona’s supposed “animus” against illegal aliens. Yet animus has nothing to do with the findings of “preemption” on which the Ninth Circuit claimed its opinion rested. Finally, our brief criticized the Ninth Circuit’s reliance on Plyer v Doe, a Supreme Court equal protection decision on which the Ninth Circuit ruelied. The Plyer opinion has been heavily criticized by those on all sides of the political spectrum, as being grounded neither in Constitutional text nor in any legal precedent. Rather, the decision was the product of judicial log rolling, cobbling together a bare majority of five justices, with Justice Brennan emoting about the “not niceness” of denying education to children. For the last 35 years, Plyler has forced states to pay billions to educate millions of illegal aliens, and no doubt encouraged millions more to enter the country illegally. Plyer’s place is the judicial wastebin, and should not be relied upon to create new “rights” for illegal aliens.